If you are wandering through life not seeing anything positive or changing in your circumstances for your good, you might consider doing a SELF-inventory, rather than blaming your situation on others or the devil. By self-inventory, I mean, check how you are speaking; what your saying about your situation(s). Much of your issues could be how YOU are speaking aka #CONFESSING or #DECLARING. Your SELF-affirmation & SELF-talk is 🔑 to your breakthrough. Daily I remind myself of the Holy Scriptures AND THEN I SPEAK THEM FORTH! – I AM loved BY GOD. – Greatness lives on the inside of me. – I AM the head and NOT THE TAIL. – I AM a disciple LED & TAUGHT of The Lord Jesus. – I AM MORE THAN a conqueror. – I AM VICTORIOUS in everything Godly that I put my hand to. – I AM bold and as fierce as a lion. I fear no one BUT GOD ALMIGHTY. – No weapon formed against me or my loved ones, CAN OR WILL prosper. – Good things come to me and those I love. – God is concerned about everything that concerns me. – God has given me every tool I NEED to succeed in the earth. Option A – If you yield (use) your sword to speak WOES, you will see manifestation of the DEATH you choose to speak, come your way. Option B – If you yield (use) your sword to speak LIFE (even when your not seeing life in your situation just yet) you will begin to see new life burst forth in every area of your life. WHY? Because we are spirit beings, living in a natural world. If you don’t speak Gods life giving word OUTLOUD, why would the devil flee? satan has no reason to leave you alone if you aiding him in by speaking death over your situation. Gods word does not return to him void. ***There are a couple of things you can do to clean up your mess and it starts with “YOUR” #MESSAGE and your attitude towards others. #1 – FIRST and foremost, confess your sins to God. Then ask Jesus to come into you life and make Him your Savior (either for the first time or rededicate your life to Him if you have turned away from Him) and start (or restart) building a relationship with Him. #2 – READ His Word written just for you, since this is the manual for your life and necessary for your success. #3 – SPEAK what Holy Spirit is highlighting in the word, over your circumstances, since these are His Promises to YOU. #4 – PRAY for those people in your life contending against you. #5 – KNOW, that the devil doesn’t have as much control over your life as you are giving him. GIVE THESE 5 SIMPLY STEPS A CHANCE TO WORK IN YOUR LIFE. I’M NOT SAYING EVERYTHING WILL CHANGE INSTANTLY OR IMMEDIATELY, BUT AS LONG AS YOU DO YOUR PART WITH #PATIENT EXPECTATION , YOU WILL BEGIN TO SEE THE FRUITS OF THE CHANGES YOU ARE MAKING…. #PEACE WILL COME TO YOU, #JOY UNSPEAKABLE WILL TAKE OVER, YOUR #FAITH WILL RISE TO NEW LEVELS AND #LOVE WILL MANIFEST. Use this YouTube link 👉🏽 Master Key , I shared on 12/12/17, to receive the 🔑 that unlocks 🔒 every door 🚪 & Be #UNCHNED ⛓, as the Kingly Priest you were created to be. It’s been a while since I “heard” Chains Breaking. I’ve been tempted to go internal and try to figure out what I was doing wrong or what I was missing. Thankfully, Holy Spirit wouldn’t allow me to and gave me an understanding that I was in the midst of more #TRAINING, that only can be received in #TIME. But today 🙌🏽🙌🏽🙌🏽 in the secret place, Holy Spirit reminded me of a truth He spoke to me, May 12, 2012. He said then, “#ITsSoSimple”. YOU KNOW I DON’T GET THINGS THAT ARE EASY! He gently responded, “YOU ALREADY HAVE IT, IT’S IN YOUR HANDS”. For the past 5 yrs, from time to time, I’ve gotten a little more revelation. For the most part, I understood He was referring to His Word and what we believe as Sons & Daughters. I’ve seen that he has allowed me go through things most believe are consequences of my own bad choices (rejection, addiction, divorce, loss of children), but actually we must stop judging what we don’t understand. God allows some to go through things, that the world believes are awful situations (as training), knowing His Child will pull through and in turn give their testimony of HIS REDEMPTIVE POWER. Meaning, I had to live the message, so that I could freely give it away. He then led me to Romans 4. 1 Let me use Abraham as an example. It is clear that humanly speaking, he was the founder of Judaism. What was his experience of being made right with God? 2 Was it by his good works of keeping the law? No. For if it was by the things he did, he would have something to boast about, but no one boasts before God. 3 #Listen to what the Scriptures say: Because Abraham #BELIEVED God’s words, his faith #transferred God’s righteousness INTO his #account. 4 When people work, they earn wages. It can’t be considered a free gift, because they earned it. 5 But no one earns God’s righteousness. It can only be transferred when we no longer rely on our own works, but believe in #The #One “WHO” powerfully declares the ungodly to be righteous in his eyes. It is faith that transfers God’s righteousness into your account! 1) To believe God and take Him at His Word. 2) To believe (place our faith in) what we see &/ or hear in the natural. YOUR CHOICE… becomes… YOUR FAITH. In verses 4 & 5, we see who we are placing our portion/ choice in… v4-Our Fleshly Ability verses v5-Gods Supernatural Ability. “FAITH… IN #JESUS, and what HE already accomplished FOR. US. on the cross” – OUR RIGHT STANDING (aka righteousness). Somebody is going to get ahold of this CHAIN BREAKING word, like I have and when they do, it will be a total GAME CHANGER! But first, I want to thank God, for My Apostle, Chris Turney, @ Kingdom Reign Ministries Church, who selflessly spends time with The Lord in prayer and studies out Gods word, so that he is able to teach me, how to live as a KINGDOM CITIZEN, in the Earth. So that I too, can encourage others for God’s Glory. I love you, Papa Chris! The Earth was created, to serve US; the sons and daughters of God, NOT us to serve the Earth!?! As Heirs, we should be ruling and reigning in the Earth and the things, of the Earth, SERVE US!!! Saints, we have got to get a hold of WHO we are and start living with a Kingdom Mindset. WE have been ADOPTED by Jehovah Elohim, the Creator of the Universe, therefore; we are no longer servants (of our former life) but HIS LEGAL CHILDREN. We are ROYALTY. Now, I don’t know about anyone else BUT, I haven’t ever seen a King or Queen who gives a command come up empty handed. Declarations are made and the servants go to work to make sure the thing that was declared, HAPPENS. As Sons & Daughters, we are Kings (Queens) & Priest and our servants are our angels, who we send forth to get what we need done. The Earth in turn works together with the angels to assist US (for OUR BENEFIT). I, for one, had to ask God to forgive me this morning. For worrying when the bill or call about the loan came in, because as a Child of God, bills are not my concern!?! My bills were PAID IN FULL by My Brother, My Lord & Savior, Jesus Christ, so that I could live in the authority given to me and RULE and REIGN in the Earth, not fret over fiery darts 🎯 sent to distract me! So, if you too, have forgotten who you are, then simply REPENT (change the way you’ve been thinking and seeing yourself). to make declarations and decrees over the things coming against us… AND by praying prayers of pleading with God, rather than telling Our Daddy what we need and expecting Him to provide it. WHAT IF the bill isn’t paid because we didn’t command the bank (in the Earth) to serve us and take care of it! GOD SAYS, I WILL SUPPLY ALL YOUR NEEDS ACCORDING TO MY RICHES AND GLORY IN CHRIST JESUS. Therefore, the issue is not God, IT’S US, not taking Him and His Word at face value, by expecting Our Needs… AND WANTS to be supplied, by OUR FATHER. Chain Breakers, we need to be doing our Kingdom assignment of breaking chains for Kingdom Purposes, not fighting battles that Jesus ALREADY accomplished for us. We should be setting captives free. But, because we haven’t taken authority over our circumstances, we haven’t been able to get to the actual Kingdom Business and start fulfilling our purpose in the Earth. Today, CHANGE YOUR MINDSET (repent); the way you have been looking at your place in the Earth and BE #UNCHNED to live your life FREE, as a Son/ Daughter of GOD, the Great Yehovah! Only when I made the post, I was only speaking out loud. BUT, when I opened FaceBook this morning, I was met with so much more than I knew how to respond. So I began to meditate on the words spoken (comments) and went on to post on something dear to my heart; ISRAEL & Her People. AFTER, making the post for a dear friend, I went back to my post to decern what Abba was speaking to me given through my Apostle, in Isaiah 49. Verse 1 – Pay Attention, I’ve called you from the womb. Verses 2&3 – I’ve hidden you, as My Servant, whom I WILL show My Glory. Verse 4 – Has been my complaint/ frustration. 9 Saying to those who are bound and captured, ‘Go forth,’And to those who are in [spiritual] darkness, ‘Show yourselves [come into the light of the Savior].’ They will feed along the roads [on which they travel], And their pastures will be on all the bare heights. 10 “They will not hunger or thirst, Nor will the scorching heat or sun strike them down; For He who has compassion on them will lead them, And He will guide them to springs of water. 11 “And I will make all My mountains a roadway, And My highways will be raised. 13 Shout for joy, O heavens, and rejoice, O earth, And break forth into singing, O mountains! For the Lord has comforted His people, And will have compassion on His afflicted. BUT… IT’S THE REST OF THIS CHAPTER THAT PULLS IT ALL TOGETHER, FOR ME!! 15 [The Lord answered] “Can a woman forget her nursing child And have no compassion on the son of her womb? Even these may forget, but I will not forget you. 16 “Indeed, I have inscribed [a picture of] you on the palms of My hands; Your city walls [Zion] are continually before Me. 17 “Your builders hurry; Your destroyers and devastators Will go away from you. 18 “Lift up your eyes and look around [at the returning exiles]; All these gather together and they come to you [to rebuild you]. As I live,” declares the Lord, “You [Zion] will indeed clothe yourself with all of them as jewels and tie them on as a bride. 19 “For your ruins and desolate places and your land [once the scene] of destruction— Certainly now [in the coming years] will be too cramped for the inhabitants, And those who once engulfed you will be far away. 20 “The children of your bereavement [those born in captivity] will yet say in your ears, ‘The place is too cramped for me’; Make room for me that I may live here. 22 This is what the Lord God says, “Listen carefully, I will lift up My hand to the [Gentile] nations And set up My banner to the peoples; And they will bring your #sons in the fold of their garments, And your #daughters will be carried on their shoulders. 23 “Kings will be your attendants, And their princesses your nurses. They will bow down to you with their faces to the earth And lick the dust of your feet; And you shall know [with an understanding based on personal experience] that I am the Lord; For they shall not be put to shame who wait and hope expectantly for Me. 25 Indeed, this is what the Lord says, “Even the captives of the mighty man will be taken away, And the tyrant’s spoils of war will be rescued; For I will contend with your opponent, And I will save your children. ISAIAH 49 WAS EXACTLY WHAT I SO DESPERATELY NEEDED TO HEAR (Right NOW Word) FROM MY LORD & SAVIOR, JESUS CHRIST!!! I say all of that to say, continue in obedience, for it is there that you receive VICTORY #UNCHNED!!! 1 Samuel 15:22 – And Samuel said, Hath the LORD as great delight in burnt offerings and sacrifices, as in obeying the voice of the LORD? Behold, TO OBEY IS BETTER THAN SACRIFICE, and to hearken than the fat of rams. When our prayers don’t seem to be reaching heaven, because we haven’t yet seen manifestation, often times we turn inward. How come “I” haven’t seen “my” breakthrough? What am “I” doing wrong? Where did “I” mess up again? We being trying to figure out how to obtain the answer from God. 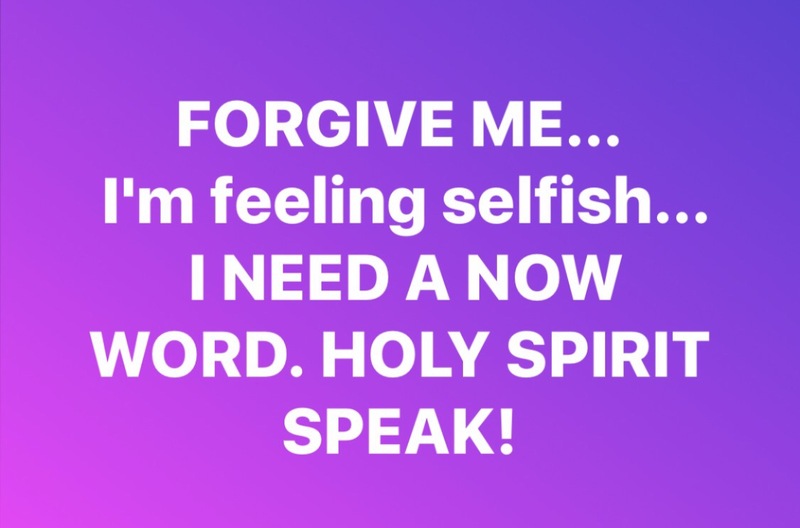 Maybe if “I” just had the right words like sister so-and-so, maybe if “I” had more to give, maybe God doesn’t really like “me”, maybe “I’m” not really loved by God… recognize these are all LIES being fed to our minds by the enemy and our own stinkin’ thinkin’. In essence, if we don’t still and stop those types of thoughts, like it or not, we begin the practice of sorcery, it’s an attempt to make us “think” we can manipulate God. The best prayers come from the depths of your being, your words, your tears of fully surrendering to the Will of God and consciously communing with Abba constantly. He is looking at the condition of our hearts, to bless and promote us. I am reminded of David in the book of Samuel. David messed up a lot, but God favored him… because He was after Gods heart. I sense some wait longer periods of time for their prayers to be answered because “they think” their is a complicated formula “they” need to figure out, to getting “their” prayer answered. Saints there is a formula, but it’s not complicated!!! 33“ So #above #all, constantly #chase after the realm of God’s kingdom and the #righteousness #that #proceeds #FROM #HIM. #THEN… all these less important things will be given to you abundantly. (aka #REST; in what Jesus already accomplished on the cross… your answered prayer according to His Promise). It’s my desire to give gifts to others throughout the year, but often impossible to give to everyone. This morning in my time with the Lord, He showed me a way that I can give a simple gift of suggestion to each one of you. Several years after deliverance from my awful past of drug abuse. I was spending to much time looking back on the previous 8 yrs and beating myself up for all of the poor choices I had made. I think we all have been subject to the enemy making us feel we wasted so many years. To the point of questioning, how could we ever leave a legacy for our children and our children’s children? During my time #STANDING for MARRIAGE RESTORATION and TOTAL FAMILY RESTORATION, I never forget Holy Spirit showing me that if He was able to get through to my stubborn self, why would I then think He couldn’t get through to my husband and family? It was then that I made a conscience effort to start sharing what I hear Holy Spirit speak in our time together. But why? Why would a come to a public forum to share my ugly past? I was quickly reminded of a scripture I read when I first came back to the Lord. Revelation 12:11. It is in sharing that I have found freedom and the desire to never go back to using to cover up my pain. Each step I have taken to expose myself to the opinions of others has allowed the Lord to add another link to my chain. Giving enough slack that eventually would allow him to BREAK THE CHAINS that have held me captive; from walking in complete and total victory. Maybe you are one like I was, that had so many hidden secrets that exposing yourself would cause others to turn from you? I determined that freeing myself from my past and allowing myself to be me (whether or not others approved), was much more important to my continuous growth and advancement in the Kingdom of God. Telling on myself (truth) was actually necessary to still and stop the enemy from advancing in my life. HIS WORD and the ability to share it with others. I’m not suggesting you tell your past to the point that you harm others. What I am suggesting is transparency. Allowing others to see and understand they’re not alone. We all have fallen and made mistakes… BUT we can get back up and be a positive influence in the lives of others. The only thing worse than falling is allowing others to believe you have never fallen. ONLY JESUS WAS PERFECT AND LED A PERFECT LIFE. Give those in your realm of influence, an open door to see you weren’t always a wonderful person. BUT a person with issues just like everyone else. When we have been freed up from our old foolish ways it is our job to teach the younger generation that GETTING UP IS POSSIBLE. It takes a conscience effort and a willingness to expose ourselves to people that may not still want to be acquainted with us because we fell back. WOULDN’T YOU RATHER WIN WITH ABBA FATHER, SO HE CAN RELEASE EVERY CHAIN TRYING TO HOLD US BACK FROM REACHING OUR FULL POTENTIAL VICTORIOUSLY?! ?